As I often share my story of recovery from alcoholism, it's no secret that at 23 years old I was a hot, albeit sick, mess. While my drinking career ended 8 years ago - there are certain practices and rituals that help me now just as much as they did then. I remember the struggle in the beginning when my head was screaming and I wanted to crawl out of my skin as I was filled with shame, anxiety and overwhelm. Yoga became an important tool for me early on in my recovery not only filling in time when I was bored (poison for me in early recovery) but also helping me soothe my frazzled nervous system. Addiction can cause great damage to an individual's psyche, and the discipline of yoga, with its natural ability to heal the mind and body, is another great tool in the arsenal of addiction recovery techniques. The practice of Yoga is something that clients can take away with them when they leave recovery to help ensure they have a higher success rate of achieving, maintaining and enhancing their recovery. 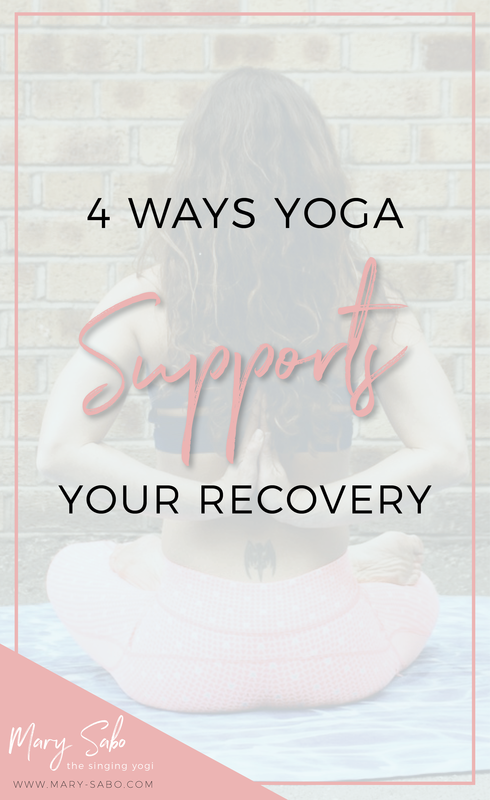 Individuals in recovery frequently experience stress, anxiety, and depression when going through withdrawal, and when yoga is practiced on a regular basis, it can help to improve these symptoms. Stress is a well-known risk factor for addiction relapse, so it's crucial that stress reduction techniques are practiced by those in recovery. Yoga can aid in reducing anxiety levels, loosen tense muscles and regulate stress hormones like cortisol and adrenaline by enlarging the region of the brain called the hippocampus, which helps to control stress. Yoga also helps to increase the release of GABA, a natural feel-good nerve transmitter released in the brain, which promotes a sense of well-being and calmness and reduces nervousness. During early recovery, chronic insomnia is a very common symptom, and if not addressed it can lead to a risk of relapse. Insomnia can have a big impact on an individual's cognition, mood and focus, thereby impacting their ability to respond to treatment. Some yoga postures, especially if practiced just before bed, can help improve quality of sleep by increasing blood circulation to the sleep center in the brain and decompressing an individual. People can sleep longer, fall asleep quicker and return to sleep more quickly if woken through the night. Addiction can take its toll on a person's physical and emotional health in recovery, causing extreme and overwhelming tiredness while in the early stages of recovery. This can have a direct impact on an individual being able to focus and learn much-needed recovery skills. Yoga poses can help to increase energy and rejuvenate the body by regulating and adjusting the cortisol hormone. The regular and consistent practice of yoga will boost energy levels by ensuring quality time throughout the day to spend on important recovery activities so you can take care of yourself and your family. The ill effects of addiction can leave people with life-threatening and chronic diseases like high blood pressure, heart disease and an increased body mass index. Yoga has been shown to improve our body chemistry by lowering blood pressure, cholesterol levels, triglycerides, sodium and blood glucose levels and slowing the progression of heart disease. It improves the circulatory and nervous system as well as the endocrine glands and other organs. The meditative practice of yoga can keep the heart rate low and improve the blood flow by the stretching of muscles and tendons. Yoga is a wonderful and healthy way to approach life and seek inner harmony and indeed becomes a way of life for many people in recovery. The low impact of yoga reduces the risk of injury and can be practiced by anyone including beginners. It's easily accessible with just a mat and a well-trained Yoga Practitioner. Another sensory-based way to support your recovery is to use essential oils. Granted permission by Elena Brower and Michelle Martello I am grateful to share this great ebook they wrote as a guide for Essential Oils for Recovery! Click to read !